Many scholarships for equine studies are available nationwide for horse lovers to finance their undergraduate or graduate degree. Equine studies programs are focused on educating students on how these large, intelligent creatures must be trained, housed, groomed, fed, and bred. Most equine science degrees will include barn workshop sessions for gaining hands-on experience with several horse breeds. Graduates are prepared to pursue diverse jobs in stable management, hoof care, equine veterinary medicine, horse training, horse racing, rehabilitation, equine journalism, and more. If you’re ready to jump into the saddle, start lassoing in some of these money-saving equine studies scholarships to afford your degree. Ranging from $4,000 to $8,000 in value, the AQHF Racing Scholarship Program is held annually by the American Quarter Horse Association for college students who are studying equine studies or a related major for a career in the horse racing industry. Eligible candidates must be accepted at an accredited college, maintain a minimum cumulative GPA of 2.5, have experience in horse racing, and exhibit financial need. Funding can be applied to two or four-year degree programs. Annually, the Eastern Pennsylvania Chapter of the Professional Horsemen’s Association (EPPHA) offers the Barbara J. Stock Scholarship for children of professional horsemen and women who are attending an accredited college to major in equine science or a related field. Qualified applicants for the $1,000 scholarship must have parents with EPPHA membership, be Pennsylvania residents, provide two character references, submit an official secondary school transcript, and write a brief one-page biography about their equestrian interests. As one of several equine studies scholarships offered by the Future Farmers of America, the Bunge North America FFA Scholarship is awarded for $1,000 annually for graduating high school seniors pursuing an accredited two or four-year degree. Acceptable majors include agriculture, engineering, equine science, public service, marketing, and management. Eligible applicants should reside in the continental U.S., exhibit strong leadership skills, carry a minimum overall GPA of 2.5, and wish to work in the agricultural field. Sponsored by the Vermont Horse Council, the Cliff Murry and Floyd Fuller Scholarship is granted for $1,000 each year for graduating high school seniors bound for pursuing equine studies at any in-state college or university. For consideration, candidates must reside in Vermont, have extensive experience with horses, be seeking an equine-related career, and be VHC members in good standing. Selection will be made based on volunteer service with horses, leadership potential, financial need, and academic achievement. Highly regarded for being one of the most lucrative graduate equine studies scholarships, the Coyote Rock Ranch Veterinary Scholarship is bestowed annually for $75,000 through the American Quarter Horse Association (AQHA). Eligible applicants must be enrolled at an AVMA-accredited veterinary medical school in the United States or Canada with equine-focused studies. Recipients must be entering their third year, maintain a minimum cumulative GPA of 3.0, and demonstrate a desire for working in equine veterinary practice. Established by the Harness Horse Youth Foundation (HHYF), the Curt Greene Memorial Scholarship will deliver $2,500 each year to honor the legacy of an enthusiastic racer in the Harness Racing Hall of Fame Communicator’s Corner. Applicants must be graduating high school seniors, plan to enroll as full-time undergraduate students, be majoring in equine studies, and express a keen interest in a harness racing industry career. Parents’ IRS tax returns must be attached to the application to demonstrate financial need. 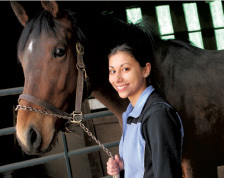 Through the Equine Science Center at Rutgers University, the Doris C. Murphy Endowed Scholarship is available annually to provide $1,000 for full-time undergraduate women who are majoring in Animal Sciences with a minor in Equine Science. Applicants must be New Jersey residents, be accepted into the School of Environmental and Biological Sciences, have academic merit with a minimum GPA of 3.0, possess unmet financial need, and demonstrate a clear passion for equine studies. The Massachusetts Horse Council (MHC) offers the Dorothy Potter Scholarship Program each year to award $1,000 to active junior or senior members in good standing who are currently attending college with any equine-related major. Along with the application, candidates must submit an official transcript showing a minimum cumulative average of 2.6, a one-page resume, and a color or black/white photograph head shot. There’s also a Board of Governors Scholarship given for high school seniors planning to study equine science. Sponsored by the American Hackney Horse Society Foundation (AHHSF), the Ed Frickey Memorial Scholarship is gifted for $2,500 each year to sophomore, junior, or senior college undergraduates majoring in equine studies. To qualify, applicants must demonstrate financial need, show involvement with Hackney horses or ponies, be committed to the equine industry, and have a track record of academic success. After reviewing applications and reference letters, finalists will be chosen and invited to a personal interview. At the University of Findlay, the Edward and Mary Crosby Scholarship is granted for $1,500 each academic year for incoming freshmen majoring in equestrian studies or pre-veterinary medicine to pursue their vocation working with horses. Eligible students must have a high school diploma, be actively involved in extra-curricular activities, hold a minimum cumulative GPA of 3.0, and plan to maintain full-time enrollment in the College of Sciences. Priority is given to those participating in the equine 4-H program. Each year, the Fritz Lang Foundation Scholarship is awarded for $1,200 per semester for several graduating seniors attending high schools in Jefferson Davis, Vermilion, and Acadia parishes. Eligible applicants must be accepted for full-time enrollment at McNeese State University, University of Louisiana at Lafayette, Louisiana Tech University, or Louisiana State University with an acceptable major, including equine science. Students must have a minimum overall GPA of 2.5 and score at least 16 on the ACT test. The Finance Authority of Maine (FAME) has created the Genevieve C. Geeve Scholarship Fund to provide $500 for graduating high school seniors who have been accepted into an undergraduate degree program for equestrian science, horse husbandry, and/or related studies. Qualified applicants must reside in Maine, be accepted at any U.S. higher learning institution, show academic merit, have financial need, and be actively involved in horse-related volunteer or community service. Since 1999, the Idaho Horse Council Education Scholarship has been granted for $1,000 to legal state residents who are graduating from accredited high schools and pursuing post-secondary studies related to equine science. Qualified candidates must hold a minimum cumulative GPA of 2.5, demonstrate involvement with the horse industry, attach ACT/SAT scores, submit three letters of personal recommendation, and exhibit leadership potential. Three of these undergraduate equine studies scholarships are awarded each year. Using funding from Team Valor International, the Race for Education hosts the Isaac Murphy Scholarship Program annually to award up to $5,000 to African American college students pursuing any equine-related major. For consideration, students must be 24 years old or younger, have a minimum cumulative GPA of 2.85, have at least sophomore standing, and display an annual household of less than $75,000 or financial independence. Recipients are chosen from Thoroughbred Scholarship applicants. Also granted by the American Quarter Horse Association (AQHA), the Jay Pumphrey Animal Sciences Scholarship is a $6,000 four-year award given to students pursuing a major in animal science, equine studies, or another large animal-related degree from Texas A&M University or Tarleton State University. Qualified candidates must be AQHA or AQHYA members, reside in Texas, have a rural farming or ranching background, carry an overall GPA of 3.0, and apply during their senior year of high school. Created in 2013 by the Indiana Horse Council, the Jim Kirkham Scholarship Fund is designed to award $1,000 annually to full-time or part-time undergraduate students registered at an accredited in-state college with an equine studies major. Eligible applicants must be Indiana residents, have completed at least 200 hours of community service in the past three years, actively participate in the equestrian community, and have a minimum GPA of 2.8. Award announcements are made at the Hoosier Horse Fair. For $1,000 apiece, the Kentucky Equine Education Project Scholarships are bestowed upon five outstanding full-time junior or senior undergraduate students who are receiving a bachelor’s degree in equine studies. To qualify, applicants must be attending an approved Kentucky university or college, be KEEP members, carry a cumulative GPA of 2.5 or higher, submit official transcripts, attach two references, have unmet financial need, and show evidence of involvement in Kentucky’s horse industry. Each year at the Regimental Ball, the California Rangers provide the Minnie’s Honor Scholarship for $1,000 in memory of a beloved Eagle Troop horse. Eligible recipients must be former Rangers, reside within California, be pursuing a veterinary or equine science major, attend an accredited U.S. higher education institution, display outstanding horsemanship skills, and be 21 years old or under. There’s also a California Ranger Scholarship awarded for $1,000 to five current cadets studying at community colleges. Annually, the Christian Harness Horsemen’s Association (CHHA) awards the Nancy Stockwell Memorial Scholarship for $1,000 to graduating high school seniors and/or college students who are pursuing an undergraduate degree in equine studies or a related major. Qualified recipients must be enrolled full-time, have financial need, show involvement in harness racing, demonstrate a strong commitment to their Christian faith, submit their Student Aid Report (SAR), and be accepted at an accredited higher learning institution. In honor of the daughter of prominent horse owner Paul Saylor who died in a house fire in 2011, the Olivia M. Saylor Scholarship Fund is granted by the Race for Education each year for up to $5,000. Eligible applicants must be New York residents, be enrolled as full-time undergraduate studies, wish to pursue a career in the thoroughbred industry, submit two recommendation letters, and display financial need. Majors could include equine studies, equestrian science, equine business management, or equine-related agriculture. Also established by the Race for Education, the Robert J. Frankel Horsemen’s Scholarship is presented annually for up to $5,000 to New York residents who are attending in-state colleges or universities to major in equine studies. Qualified candidates must come from families employed in the thoroughbred industry, be 24 years old or younger, achieve a minimum cumulative GPA of 2.85, and demonstrate an annual household income under $75,000 or financial independence. Recipients are chosen from Horsemen’s Scholarship applicants. Through the Minnesota Horse Council (MNHC), the Tony Gasser Memorial Scholarship is granted annually for at least $3,000 to up to 11 graduating high school seniors and college undergraduate students majoring in any equine-related field of study. Qualified candidates must be at least 18 years old, reside in Minnesota, demonstrate a horsemen’s background, have scholastic achievement, and possess leadership potential. Applications must include three letters of recommendation, proof of acceptance or enrollment, and official transcripts. In the amount of $1,000, the USPC Champion of Equine Service Scholarship is awarded via the EQUUS Foundation for a minimum of four college students with at least one semester remaining of undergraduate and graduate studies in equine science. Eligible recipients must carry a minimum overall GPA of 3.0, volunteer with the Equine Welfare Network, perform at least 24 hours of community service, and attend an accredited U.S. college. Certain Champions will receive a $250 gift certificate for Ariat boots too. At the University of Massachusetts Amherst, the Victor A. Rice Scholarship Program will provide $1,000 annually to currently enrolled students who have completed at least one full semester of the animal science, pre-veterinary, or equine management program in the Stockbridge School of Agriculture. Eligible candidates must be actively involved in equine-related UMass clubs, research projects, internships, and/or independent study activities. Other undergraduate equine studies scholarships include the Anthony Borton Scholarship and Drew Memorial Scholarship. For up to $5,000 per year, the Washington Thoroughbred Foundation Scholarship is bestowed upon a Washington resident attending an in-state college to pursue a degree in equine science, racetrack management, equine business, pasture management, or pre-veterinary equine medicine. Qualified students must carry a minimum 2.85 cumulative GPA and have an annual household income under $75,000 or financial independence. Online applications should be accompanied by a 500-word essay, two recommendation letters, official transcripts, and FAFSA forms. Even though some equine jobs don’t require a degree, attending an accredited university can unlock better opportunities for horsemen and women. According to the NAEAA, 76 percent of college equine studies majors complete a valuable internship that leads to promotion. Affording your associate’s, bachelor’s, or master’s degree can be challenging with rising tuition though. Unlike loans that rack up debt, scholarships give free gifted money that won’t need to be repaid. Consider applying for some of these great scholarships for equine studies to follow your passion for horses.